Unfortunately peertube needs nodejs8 and I needed to replace the centos nodejs stack because rh-nodejs8 is not working, see Nethserver-collabora CODE testing and discussion so please don’t run in production. You need a virtualhost domain like virtualhostdomain.tld. Note the user password and exit journalctl with CTRL-C.
Browse to https://virtualhostdomain.tld and login with the given credentials. Thank you very much, for this how to. And thank you, to show how this community is great and have loving memebrs. Thanks a lot @mrmarkuz! Great work. I received a response on my question about NodeJS. Yes, as it does not touch the systems nodejs, I just have to find the best way that the peertube service uses the nvm version. Would this effect Onlyoffice using Nodejsv8? I think nvm could be used for onlyoffice too. But the best way still would be rh-nodejs8 as it’s provided by system package manager and updated. I’ve test this install, everything works expect to save a new configuration in the web admin interface. But it doesn’t make the job. The result is the same: this file can’t be written. Confirmed, I get the same error. 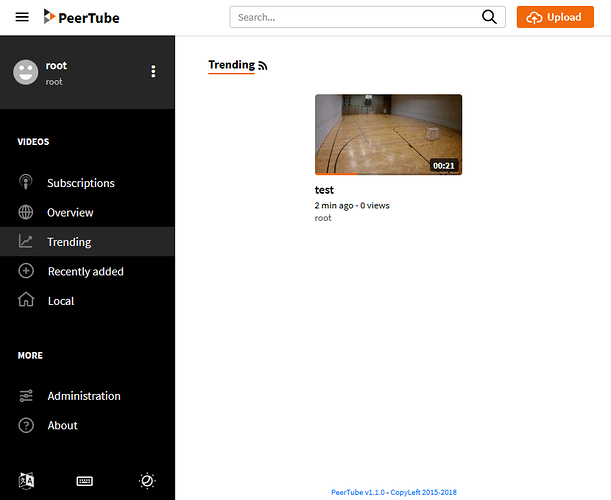 As a workaround you may edit /etc/peertube/production.json to fit your needs as recommended in the peertube install docs for centos instead of using the web UI. Don’t forget to remove /etc/peertube/local_production.json and restart the service with systemctl restart peertube. Thank you, it’s what I already done. But do you think there is a ‘clean’ solution ? Maybe it works with the production version, this howto uses the community packages. I never tested on another distro than NS7.